So the real title of this meal should be: Sesame Teriyaki Chicken with Fennel Mushroom Peaches – but it was too long for my format! As the only child of a single, working mother, coming of age in the 80′s I ate a lot of meals that started in a box, can or the microwave. This being said, you shouldn’t find it too funny when at 19 years old, Teriyaki sauce was the first “exotic” food I learned how to make. This dish starts off with the marinade. Technically, teriyaki sauce is, 50% soy sauce 50% sugar. So, depending on how much sauce you need, you can adjust the recipe accordingly. For this, I probably used about 1/2 cup of low-sodium soy sauce and about 1/4 cup of natural, unbleached sugar and about a tablespoon of freshly shaved ginger. Mix well, place the raw chicken in the sauce and set aside. Next I put brown rice in the rice cooker and chopped up some veggies for the side. After browsing the refrigerator for ingredients, I decided to chop up 1/2 a head of fennel, 8 to 10 mushrooms and two firm peaches. About halfway through, heat some oil in another pan and start sauteing the fennel. After about 2 minutes add the mushrooms, stir for a few, and lastly add the peaches. Mix for a couple minutes and serve as shown. Drizzle a little bit of the sauce over the veggies too, if you like!! 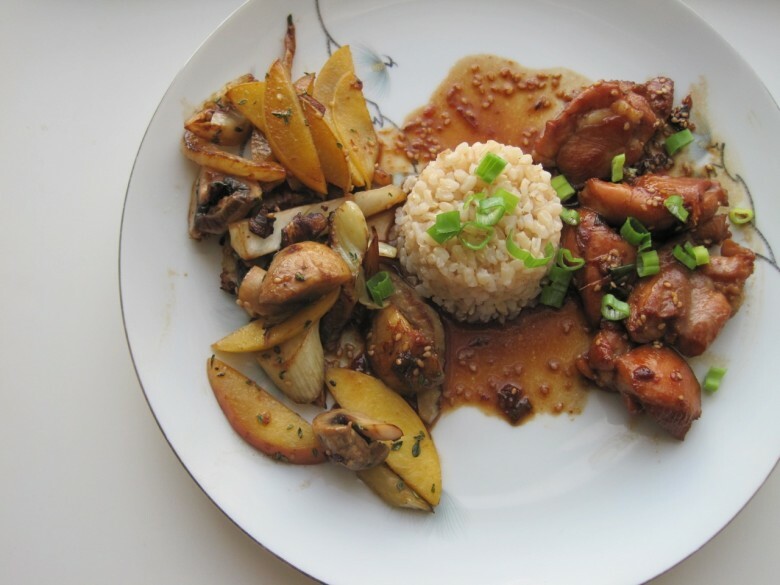 July 27, 2011 | Filed under dinner and tagged with chicken, fennel, mushroom, peaches, rice, sesame, teriyaki.